One striking example of how climate and climatic perceptions could shape history is Los Angeles. It is difficult to overstate how appealing, even amazing, Southern California’s climate once seemed (and still seems, during the Rose Parade telecasts) to eastern Americans. Rarely humid, occasionally hot, but almost never below freezing, most of the year the climate was moderate, with some rain for agriculture, aided by irrigation. According to its promoters, its climate could create wealth, restore and preserve health, and facilitate outdoor recreation, as well as a closeness to nature that many eastern Americans found alluring. It drew tourists and new residents. Climate, in short, made L.A., shaped its urban development, and ultimately would transform cities across the nation. Mild winters meant that farmers could grow luxury crops such as oranges, lemons, and avocados that were expensive and scarce. Instead of just family sustenance, one could have wealth from a Southern California farm. Even more compelling than wealth, however, was health. Perhaps as much as twenty-five percent of the total migration to Southern California prior to 1900 came due to illness. Communicable diseases were poorly understood, and many believed that sickness – especially respiratory illnesses – were caused by “bad” climates. Humid air, especially from swampy areas, could form “miasmas,” air supposedly laden with infection. With tuberculosis a terrifying, incurable prospect, the dry air and steady temperatures of Los Angeles were considered miraculous, able to ward off infection or even cure the ailing. Many sick migrants were directed to “take” the sun – essentially, to sunbathe. If they felt better, it was most likely because their skin, usually protected by heavy clothes and parasols, was metabolizing Vitamin D, essential for healthy immune function. Taking the sun proved popular not just with the ailing, but also with tourists and new residents. At public beaches and resorts such as Santa Catalina Island or Palm Springs, Southern California perfected its reputation as a place of recreation. Inveterate local “booster” Charles Fletcher Lummis, editor of the magazine Land of Sunshine, claimed that Southern California “was destined to show an astonished world the spectacle of Americans having a good time.” Far more potent than any individual promoter, however, was Hollywood. Hollywood cemented L.A.’s national and global reputation as the city that had perfected leisure. Newsreels of movie stars frolicking at local resorts and films that showcased the natural landscapes and lushly landscaped yards and neighborhoods of L.A. screened worldwide. The bungalow neighborhoods of Los Angeles offered a vacation-themed permanent lifestyle. Bungalows were first popularized in the U.S. as resort housing, and promised a simpler way of life, with verandas and yards that made it possible to live residential life outside in balmy weather – which in Los Angeles was most of the year. New residents of the city sometimes even paid for photographers to make postcards of their new homes, which could then be sent to eastern relatives and friends as if the homeowners were visiting some seaside resort. And in a sense, they were. Trains connected the towns of Southern California to each other, and to the beaches and mountains that drew tourists and residents alike. The automobile would only increase this mobility. Rather than life in a cramped city apartment, or isolation on a rural farm, Angelenos could live in a de-centralized, dispersed landscape of residential housing, farmland, and retail and business centers – in other words, suburbia. Yet leisure was a commodity for affluent whites only. Everyone else was expected to provide labor in this realm of leisure. This restrictive worldview, and the conflict it engendered, was soon apparent right at the city’s heart. The Plaza, near the site of the pueblo’s original founding in 1781, was the product of an urban plan that went back to Spain, and before that to ancient Rome. Whether a small plaza in the new settlement of Los Angeles, or the great plaza, the Zócalo, in the heart of Mexico City, these open urban spaces were emphatically public. Depending on the day, one might find a market, a religious procession, a parade, a political event, or a protest. Parks in the eastern U.S. were distinctly different – ornamental, and intended for genteel recreation, not raucous celebrations or protests. When the Mexican political leaders of Los Angeles were supplanted by Anglos, this change was made manifest in urban space. The empty space of the Plaza was remade into a circular park, with flowers, grass, and a fence that walled off much of the former Plaza as an ornamental garden. It might have been pretty, but its political message was decidedly blunt. 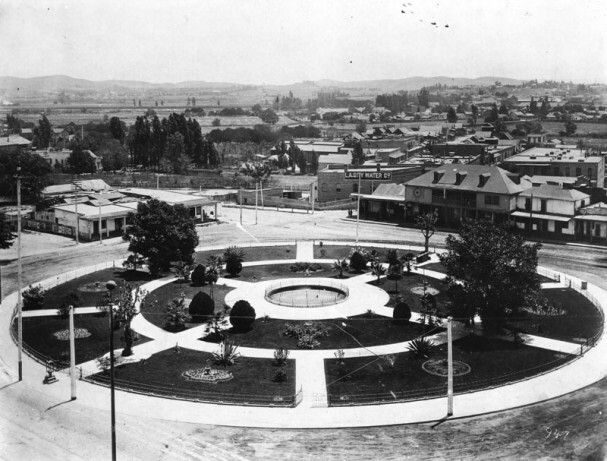 By 1900, however, remaking the Plaza, which was located in a predominantly Mexican neighborhood, was no longer enough. By then government attention shifted westward to a square called the “South Plaza,” or “Central Park,” which lay in the heart of the new Anglo downtown. This park was subsequently renamed Pershing Square, and its fountain and lush landscaping made it a favorite lunchtime gathering place for white-collar workers. The unhappy history of Pershing Square is emblematic of the larger history of public space in Los Angeles. A city that sold its climate and outdoor recreation to the world simultaneously restricted access to parks, pools, and beaches, segregating them first by race, and, in the longer term, by class – the city’s poorest and most crowded neighborhoods still have the least access to parks. The city did little to acquire parkland, even though it was the first city in the nation to impose a city-wide planning and zoning ordinance. Some such zoning was explicitly racist. Restrictive housing covenants meant that in much of the city, homeowners could be white – meaning Anglo – only. Leisure did not fade as an attraction in Los Angeles. It was, however, increasingly restricted, hidden away from public view at private resorts and in suburban backyards. The bungalows of the 1920s were succeeded by the ranch houses of the 1950s, with patios and large backyards for family socializing. After World War II, many such houses were purchased with mortgages financed by the Veterans Administration or the Federal Housing Administration, triggering a mass migration to new suburbs and the sunbelt South and West. Though the funds were federal, the mortgages were offered by local banks, and most such banks would not offer mortgages to anyone who was not white. As family incomes grew, and mass-production made construction less expensive, more and more of these ranch homes came complete with what had once been an unimaginable luxury – a swimming pool. Yet these backyard pools in overwhelmingly white suburbs were testaments to the allure of privatized leisure. Most were built in the same years when public swimming pools were finally racially integrated. Southern California’s climate had indeed facilitated a culture of outdoor recreation that proved popular across the nation. Yet the mass suburbanization of America was also the mass segregation of America, and the lure of a recreational life outdoors had been transformed into a private, inward-looking way of life. First in Los Angeles, and ultimately across the nation, the consequences of climate proved powerful indeed. Lawrence Culver received his doctorate in History at UCLA. His first book, The Frontier of Leisure: Southern California and the Shaping of Modern America, was published in 2010. He is now working on a new book project, Manifest Disaster: Climate and the Making of America. *Photos courtesy of the Los Angeles Public Library Database.